Brief Synopsis – A group of American prisoners in a German POW camp must try and figure out who is giving vital information to their captures which hinders any kind of escape plan. My Take on it – This is a film that has been a favorite of mine ever since I first saw it as a kid. The way that the story is both a clever whodunit and a drama about the hardships of American POW’s in German camps is amazingly shown because it allows us to get a clear idea of the conditions these men faced. The story plays out really well and they are able to mix in bits and pieces of humor in the story in order to help balance the heavy themes that this film deals with. 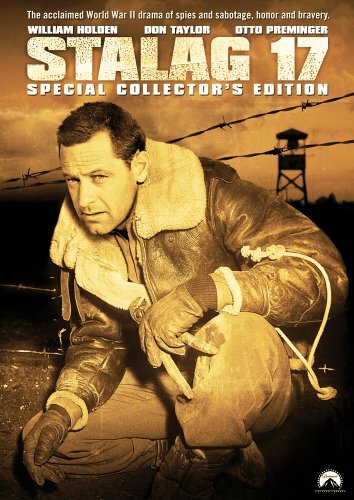 The entire cast is great but William Holden is superb in the lead and was quite deserving of his Best Actor Oscar for this role because of the way that his character remains selfish throughout and isn’t turned around despite the events of the film. The dark nature of this film would not be so easy to watch without the humor that is peppered throughout because it allows us to get a more comfortable feeling for such an environment that they present to us. Billy Wilder was quite deserving of his Oscar nomination for Best Director for this film. This film remains one of the best Prisoner of War films ever made even after 65 years. Bottom Line – Amazing film that manages to try and show some of the issues faced by POW’s under the careful watch of their captors while also presenting a clever whodunit. The way that the story plays out works really well and we get a clear idea of the conditions they were faced with the entire time. The cast is superb but Holden clearly stands out as the best in the lead role which garnered him a Best Actor Oscar for playing such a character. The mix of humor and drama actually works to this films advantage because of the dark nature of the environment presented since it allows us to feel more comfortable watching such a situation. Wilder deservingly got an Oscar nomination for Best Director for this film. This film remains one of the best prisoner of war films every made. Highly Highly Recommended! Perfect. This has always been one of my favorites, and I was pumped to be able to write about this movie in a William Blog-A-Thon a few months back. I’ve always thought Colonel Von Scherbach is under-rated as one the great movie villains.